This beautiful mountain cabin offers 2 bedrooms, 2 baths, an outdoor hot tub, a separate sauna house with cedar sauna for 3-4, a large 20' x 20' deck, several outdoor patios, landscaped gardens, and the beauty and seclusion of the forest all around. Large, sunny windows give lovely forest views in this peaceful setting in the woods. Inside is a comfortable living room, dining room and kitchen with one large bedroom and one small bedroom. There is a large second bath in the spa/sauna house with a travertine tile, 4-person shower. Sit by the woodstove in the winter or enjoy air conditioned comfort in the summer. Fish, go boating or swim in the nearby lakes, or hike/bicycle, You will love the privacy of this property and never see the neighbors. Close to the grocery store, antiquing, shopping, lakes, Apple Hill and the wine country too! There is a small airport nearby for your private craft if you choose to fly in. The owners have lived in the region since 1980, in a remodeled 1898 Victorian home in the Sierra Nevada foothills. They wanted a mountain retreat to escape to on weekends and have always loved the beauty of the Georgetown area. The owner's discovered this place during a tour of Georgetown and fell in love with the beauty of the site. Originally a primitive cabin, they reconstructed this into a beautiful, resort-like home with everything you need for the perfect mountain retreat. This cabin is a mountain escape, with everything you would expect from a fully-furnished private resort. Comfortable and sunny cabin, large outdoor spa tub, separate Miner's Cabin sauna house with huge tiled shower and full bath, large deck and patios, and beautifully secluded forest all around. The full bath in the cabin is large and comfortable. The second bath in the sauna house features a large travertine tile shower, separate toilet and sink, changing room, front porch, and a 3-4 person cedar infrared sauna with CD player and speakers. Beautiful mountain property in the pine trees. The house sits in the center of 5 forested acres, surrounded by tall pines, madrones, oak and redwoods. Completely private and peaceful. The nearby village of Georgetown is just down the road, with all the amenities you need. Yet you will feel like you are miles away from the world here. Wall heater, portable electric heaters, fireplace. Plenty of firewood is available on the property for free. Large, comfortable, L-shaped living room/kitchen/dining room area. The dining table has 4 chairs but you can bring in chairs from the patios outside or dine out on the patios or the deck. Games, books, toys, magazines are available in the cabin. A basketball court is outside. Also, there are outdoor games available upon request. Toys are in the cabin. Large 20' x 20' patio in front, additional patios all around with outdoor furniture. Large 20' x 20' deck in the trees. The property is fully accessible by wheelchair, with the exception of the sauna house and the hot tub. Main house, deck, and patios are all easily accessible by wheelchair. The separate 'Miner's Cabin houses the lovely cedar sauna, travertine tile shower, adjacent sink and toilet. The hot tub looks out into the trees with the large deck nearby. All around is forest in this completely private property, like a small resort all to yourself! Beautiful private place to stay! We love the beauty of this place! Loved our stay over Valentine's Day weekend! The place was very cute and comfortable. Lots of like extra touches that made the stay nice. Rose the owner made this last minute stay very easy and convenient. Highly recommend this location just for a weekend of relaxing and no hassles type get away. Walking distance to a grocery store. We loved our time so much last year, we had to return again. The owner is SO accommodating and helpful. This location is flawless and we will certainly be returning again! Perfect weekend getaway! We have had many memorable stays at this wonderful cabin located in the middle of a 5 acre setting. The cabin is totally surrounded by trees in a park like setting. We enjoy coffee on the deck in the morning while watching the resident deer meander through the property. Nights in the hot tub while watching the stars reveal themselves is mesmerizing. Stars sure don't look this bright in the city. Rose is an amazing host. In as much as she was a local Park Ranger, she knows all the local history. Great home tucked in the woods in a perfect part of Gold Country. The outside deck, hot tub, and sauna/shower make this property special. It's small, best for a couple or intimate friends, but everything is close by and the home is well-appointed. The owner is attentive and easy to deal with! The cabin was so perfect for a getaway. We loved how private the property was- it really felt so peaceful. Also loved the hot tub and sauna! I would definitely recommend this rental. 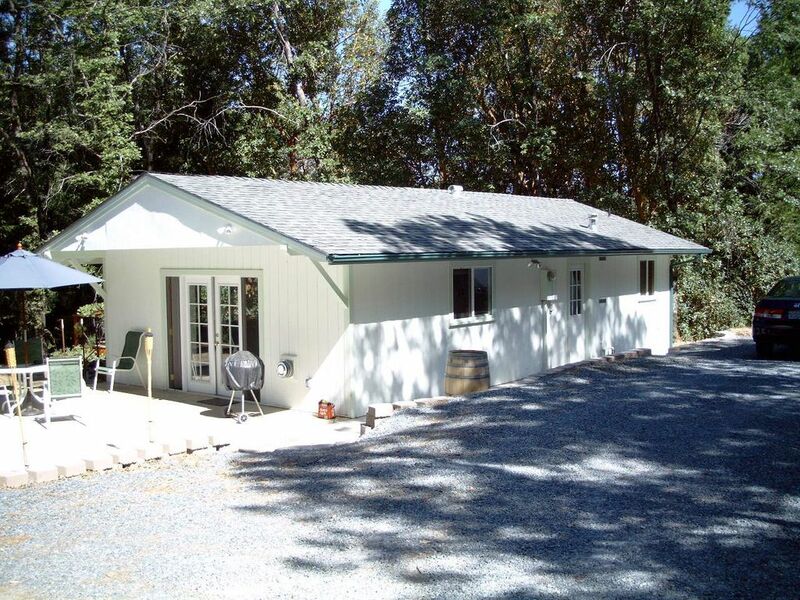 The house is located in the center of five beautifully forested acres in a peaceful area. You will feel like you are miles from everywhere, yet just a short walk down the road is a lovely shopping village with full size supermarket, gym, hardware store, restaurants, antique shops and so much more! The Gold Rush village of Georgetown is one mile up the road, and is a window to the past with antique shops, saloons, restaurants, hotels, library, parks, churches, and more. Nearby are the larger Gold Rush towns of Auburn and Placerville. There are numerous wineries in the regions to enjoy. This High Sierra gem is tucked away in the mountains and close to a dozen sparkling lakes. Hike, swim, fish, bicycle in summer, cross-country ski or snowshoe in the winter; this property is in a perfect location for a mountain adventure or a private getaway.